Softer cosmetic fillers offer a lot of versatility for issues under the eyes, from hollowness, deep tear troughs, and even slight under eye bags. The under eye area may have a hollowed look due to genetics, volume loss due to aging, or from environmental and health factors such as excessive sun exposure, or habits such as cigarette smoking that can affect the skin internally and externally. Hollowness can affect the whole under eye area all the way to the upper cheeks, or just the small area directly below the eyes called the tear trough. Hollow, tired-looking eyes are often caused by lacking volume in an area commonly called the tear trough. While not all doctors are comfortable injecting cosmetic fillers in the under the eyes, eyelid specialist Amiya Prasad, MD commonly treats this area for a more vibrant appearance. Hollow eyes can be effectively treated with a softer hyaluronic acid filler such as Restylane, Restylane Silk, or Juvederm Ultra to add volume. New fillers continue to be developed which can also be useful. A softer filler is appropriate as lower eyelid skin is the thinnest in the body at 0.5mm of thickness, and can move flexibly with facial expressions – softer hyaluronic acid fillers don’t affect the appearance of the eyes like thicker filler or facial implant. The more malleable filler is also more easily molded and customized to fit an individual’s unique space under the eyes. The whole procedure, and any additional touch-ups can be performed in just a few minutes. Injectable cosmetic fillers like Restylane, Restylane Silk, and Juvederm Ultra typically last about 4-6 months, depending on how individual patients metabolize the material. Hyaluronic acid, the primary material most commonly used in modern cosmetic fillers, occurs naturally in the body, is safely metabolized with time, and is hypoallergenic. Continuity and contour due to hollowness under the eyes and upper cheek can be restored in minutes with dermal fillers. 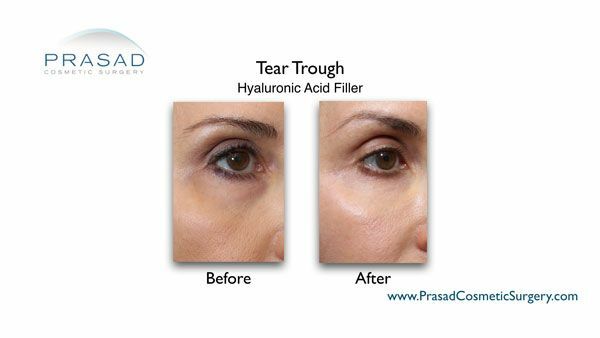 A particular benefit of using a hyaluronic acid filler is that if the need arises, the procedure can be reversed. The hyaluronic acid fillers can be dissolved with the enzyme hyaluronidase for complete reversal and safe absorption by the body. 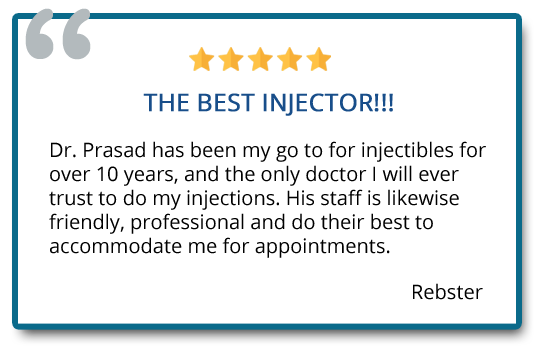 Dr. Prasad often combines a cosmetic filler with platelet-rich plasma (PRP) under the eyes for a synergistic benefit of improving skin quality, color, volume, and also to potentially extend the effect of the filler. Platelet-rich plasma is derived from the patient’s own blood, which is spun down to separate red blood cells, and the concentrated plasma containing various growth and healing factors which are important to heal cuts and wounds. The concentration of these growth and healing factors stimulate collagen, stimulate the creation of new blood vessels, improve circulation, and improve skin thickness and volume. PRP improves the quality and health of lower eyelid skin affected by pigmentation issues and iron deposits that cause discoloration. There is a perception that lower eyelid hollowing is best treated with transferring/grafting a person’s own fat. This perception is understandable as fat is already part of a person’s anatomy, is naturally occurring, and can (to the frustration of many) last a long time. However, transferring fat is deceptively complex and unpredictable for several reasons. Fat is a texturally inconsistent material, so lumps, bumps, and discoloration are likely issues which can be seen through thin eyelid skin. Fat also needs to be transferred to readily available blood supply in the area. If the fat does not heal as intended, removing it is an intricate and costly procedure. Fat can also be quickly absorbed by the body, so anywhere from 30-70% may be lost due to absorption, making an additional volume enhancement procedure necessary. 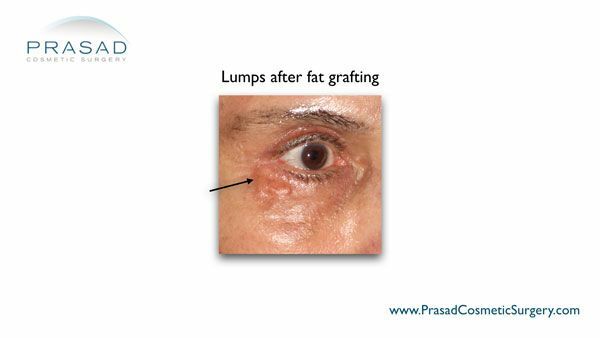 Fat grafting is a double surgical procedure: one to harvest the fat, and one to place it. “Touch ups” due to fat absorption requires another surgical procedures. Removal of transferred fat due to complications is extensive and expensive surgical procedure after fat grafting, This is in comparison to dissolution of hyaluronic acid filler which takes minutes and does not require open surgery. The inconsistent texture of fat visible in thin eyelid skin, and its unpredictability in taking to a blood supply can cause poor results in filling hollow eyes. Revision surgery to remove fat transferred under the eyes is a complex and costly procedure. Under eye fillers in comparison have a smooth texture, are highly malleable when initially placed, do not require a blood supply, are safely accepted by the body, and can be dissolved or safely absorbed by the body. Some cases of hollow under eyes, and asymmetry between of both sides of the face may not be due to hollow tear troughs, but from volume deficiency in the upper cheeks. The upper cheeks can have a volume difference from natural asymmetry of one side from the other, or from volume loss due to aging. In such cases, adding volume with a filler at the tear trough may not be effective enough, and can be problematic as there is no “shelf” of the upper cheek to support the volume. Adding under eye filler to the tear trough without cheek volume to support it may cause the eyes to look puffy and unnatural. In such cases, adding filler to the cheeks can make the eyes look less hollow, and the whole face more balanced and youthful. Placement technique is important to avoid an overfilled look. 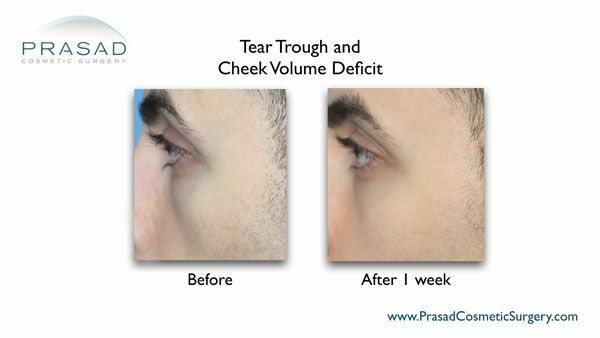 Volume deficiency at the upper cheek is treated differently than the tear trough. Skin at the cheek is much thicker than thin eyelid skin, and the cheek is also backed by the more rigid cheekbone. A thicker hyaluronic acid filler such as Juvederm Ultra Plus or Juvederm Voluma can be used in the cheeks. These thicker fillers for the cheeks also last much longer that tear trough fillers – up to 1-2 years, respectively. A specialized technique of placing fillers at the cheeks and other facial areas is called Structural Volumizing, or the Y Lift® method. Structural Volumizing places long-lasting fillers such as Juvederm Voluma or Juvederm Ultra Plus at the bone level to address bone loss due to aging, providing foundational volume. This is in stark contrast to fillers normally placed in soft tissue, which may not support the weight of the filler, resulting in the material weighing down the face, or resulting in a doughy or pillowy appearance. With the strong foundation of bone and held in place by the facial muscle layer, Structural Volumizing adds definition and youthful fullness, with natural looking results. More filler volume can be placed with Structural Volumizing than traditional filler placement as the weight sits atop the bone structure, and muscle retains the desired shape far better than fat and soft tissue. With thicker skin in the cheeks, fat transfer/fat grafting is also an option to add volume, but the nature of fat does make it less predictable. A second surgical fat transfer procedure is likely needed due to natural absorption of the fat by the body, and the texture and shape inconsistency of fat. 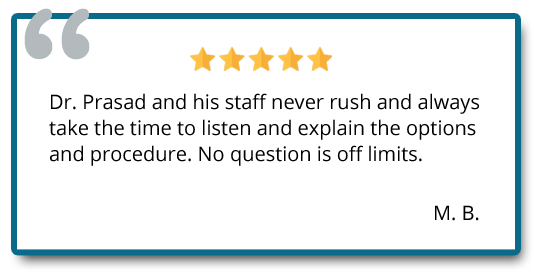 Fat grafting is also complex and lengthy surgical procedure when compared to injectable fillers that can be done in minutes. Cosmetic fillers to treat under eye bags is one of the most sought treatments in cosmetic medicine. Its popularity is due to eye bags being one of the most common aesthetic issues since it is most frequently due to genetics, not aging, so many young people are dealing with under eye bags. The most common complaints of young people about eye bags are they make them seem more tired, weary, and older than they actually are. Fillers are most often sought to treat eye bags because it is quite typical to be their first ever cosmetic procedure, and is preferable to undergoing surgery. Eye bag filler such as Restylane or Juvederm can be used reduce the appearance of mild puffiness under the eyes or when people are not quite ready for eye bag surgery. Eye bags can be treated without surgery using injectable fillers, but only in cases where the eye bags are slight. This may go against recommendations of other doctors who may say that almost any case of eye bags can be addressed with filler. 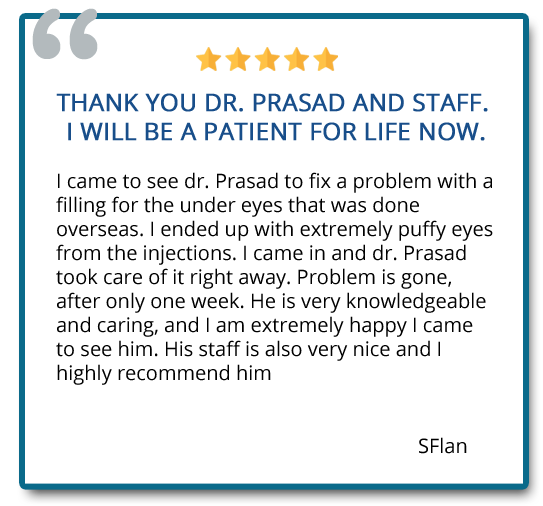 As a specialist of the eyelids known for his results in both eye bag surgery and injectable fillers, Dr. Prasad frequently counsels his patients to understand that fillers are not appropriate for all eye bags cases. Fillers can paradoxically add more volume to the under eye area where fat is already causing large eye bags, so an attempt to camouflage the puffiness often makes the situation worse. Slight cases of eye bags can be treated by blending a comparatively hollow area of the under eye region called the tear trough with the adjacent puffiness under the eyes. A hollow tear trough can make eye bags appear larger. Think of the hollow tear trough as valley, while the eye bags are a mountain next to the valley – by filling the depth of the valley with a filler, the mountain next to it won’t appear so large. However, with larger eye bags, attempting to add filler to camouflage it can make the under eye area look more voluminous, and will likely make the eye bags appear even larger than prior to treatment. 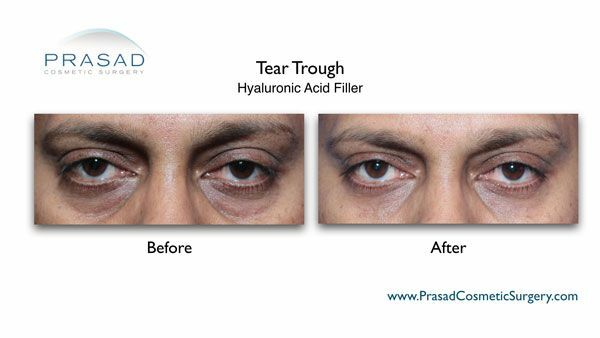 As an Eyelid Specialist surgeon, Dr. Prasad often sees cases of overfilled under eyes, and frequently dissolves the hyaluronic acid filler with the enzyme hyaluronidase. From there, he decides if the eye bags can still be blended with filler, or if the fat causing the eye bags requires surgical removal. It is crucial to sometimes leave or reposition some of the fat that causes puffy under eye bags. However, even if eye bag removal surgery was executed well, with good contour, adjacent areas may still appear hollow. Adjacent areas may include the upper cheeks (eyelid-cheek conjunction), or hollowness at the orbital rim of the eye socket. In areas where fat repositioning is not appropriate, an injectable filler can be used improve the hollowness, whether it’s a thicker filler like Juvederm Voluma or Juvederm Ultra Plus at the cheek, or a softer filler like Restylane, Restylane Silk, or Juvederm Ultra at the orbital rim and tear trough. While slight eye bags can be treated with filler, it is important to know prior to treatment that periodic maintenance will be needed. 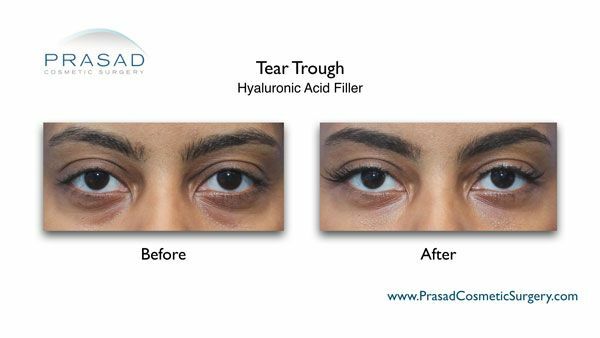 Hyaluronic acid fillers are safely broken down by the body, and hyaluronic acid is a naturally occurring substance in all of us, so there is no actual danger. However, since fillers used in the under eye area are softer and less viscous, they also do not last as long as thicker fillers, even though these fillers are made of hyaluronic acid. Expect filler treatment for under eye bags to be repeated every 3-6 months. In contrast, removing eye bags surgically can last anywhere from years, decades, or can last permanently. Eye bag surgery with local anesthesia, and under eye filler treatment can both take about a week to recover from temporary bruising. Many people choose to have cosmetic fillers to treat eye bags because they want to avoid surgery, or because they want something that’s not invasive. However, since fillers are placed via injection that penetrates the skin, filler placement is an invasive procedure. 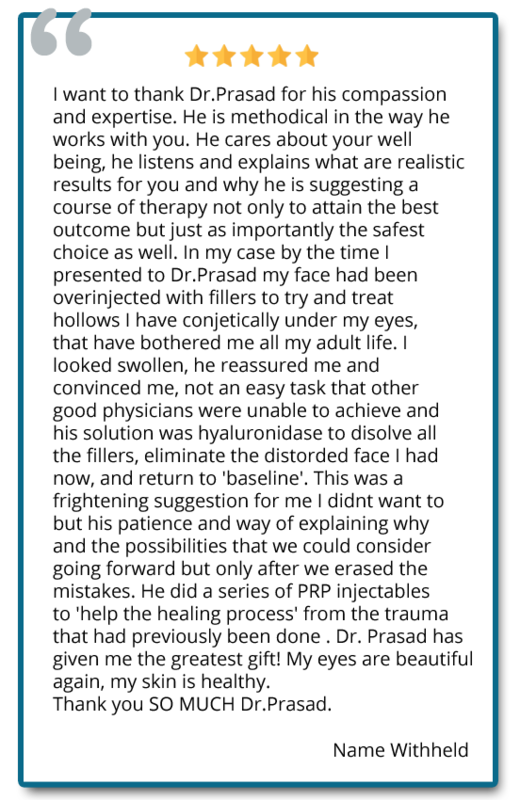 Dr. Prasad almost always performs eye bag surgery through the transconjunctival blepharoplasty method, which requires no external incision in lower eyelid skin. The procedure is performed from behind the lower eyelid skin, where the fat that causes eye bags is removed, repositioned, and sculpted. It is important to often leave some fat behind and sculpt it for contour as to not leave the under eye area looking hollow. Since there is no external incision, there is no chance of a telltale external scar of surgery. This is a more specialized technique when compared to the more common transcutaneous blepharoplasty method that does require an external incision to remove and sculpt the fat that causes eye bags, which is practiced by most general plastic surgeons and non-eyelid specialist surgeons. The transcutaneous blepharoplasty technique is also more prone to complications such as eyelid retraction (pulled down eyelids) and ectropion (everted lower eyelids) as it can compromise lower eyelid support structures. 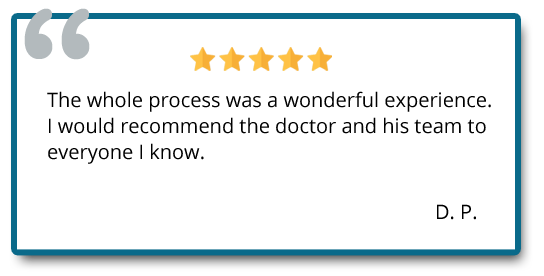 While it doesn’t usually doesn’t occur in Dr. Prasad’s hands, bruising of the under eye area is commonly seen after injectable filler treatment for eye bags. The bruising is temporary, and can last about a week. 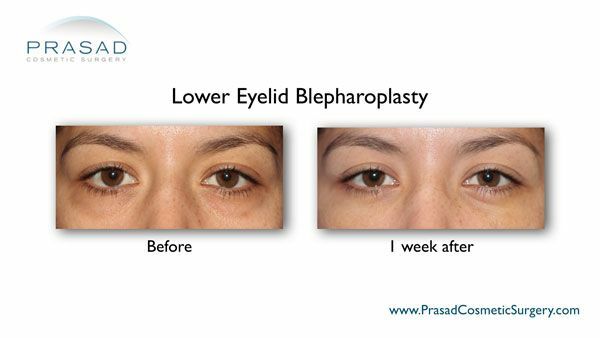 Similarly, recovery from transconjunctival blepharoplasty done under local anesthesia also lasts about a week. The difference here is that blepharoplasty to remove eye bags lasts for years, or even permanently, while filler treatment will need to be repeated, and recovery from bruising may need to be repeated as well. To find the best treatment for your under eye problems, a proper physical evaluation is necessary. Contact us by filling out the contact form below, and we’ll get back to you. You may also reach us in Manhattan, New York City which you can call at (212) 265-8877, and Garden City, Long Island at (516) 742-4636.